Dr. John T. McDonald of Alpine traveled on horseback to treat his many patients in this area. I’ve discovered recently that once upon a time, Tennessee government had a lot of creative people employed. A good example of just exactly what I mean by this is the fact that in 1937, the Tennessee Department of Conservation was created with the purpose of "working toward a program of restoration, development and conservation of our renewable and non-renewable natural resources." Gordon Browning was governor of the State of Tennessee then and appointed Sam F. Brewster as the first Commissioner of Conservation in Tennessee. In order to accumulate and disseminate information on the natural resources of Tennessee, a new magazine, Tennessee Wildlife, (later The Tennessee Conservationist) was developed. Photographers were hired for the Education Section with duties that were widely varied. One day a staff photographer would be assigned to take landscape shots in Williamson County and the next day, he might be charged with photographing events in the governor’s office at the State Capitol. The photographs were printed in The Tennessee Conservationist, but were also used throughout state government. A couple of way pictures were used included tourism brochures and even displays at county fairs. One of the 33 different categories of photographs was called Arts, Crafts and Folklife and contains hundreds of wonderful pictures of mountain people in East Tennessee. Many of these images show these people engaging in the crafts that maintained their way of life in the hills. Among the pictures are two that I’m including with this journal entry today. The first is of Dr. John T. McDonald, a native of the Alpine community. Dr. McDonald received his M.D. degree at the University of Nashville in 1900. He practiced medicine around Alpine for over 50 years, traveling on horseback for many of those years. He was a Mason and of the Catholic faith. 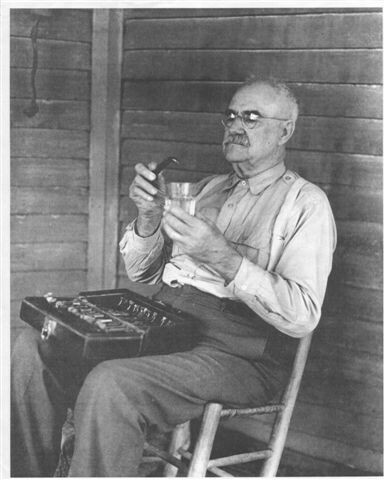 He was the last country doctor to practice in Overton County. He is buried in the McDonald cemetery. The photograph was taken as he sat on a porch somewhere mixing medicine. The lady seated by the fireplace is Mrs. Ollie (Smith) Robbins of Alpine. Born on June 26, 1884, she was the wife of Sam Allen Robbins. The explanation of her picture says she was making a rug. That old saying, "All good things must come to end" certainly applies regarding jobs for photographers working for the Department of Conversation. In 1976, the General Assembly created the Department of Tourism and also developed the Tennessee Wildlife Resources Agency, formerly the Game and Fish Commission. And with the creation of the TWRA and its own publication, the need for the Department of Conservation to maintain its photographic unit ended. By 1980, the unit was closed down. Thank goodness, there had been over 11,000 pictures taken before this program came to an end, and some 80 boxes that also contained 21,000 negatives were stored. The photographs are now located in an environmentally-controlled vault at the State Library and Archives. What priceless treasures, all as a result of someone’s creative mind put to use in establishing jobs for photographers who certainly have helped preserve our heritage along with our non-renewal natural resources, those captured in those wonderful photographs. 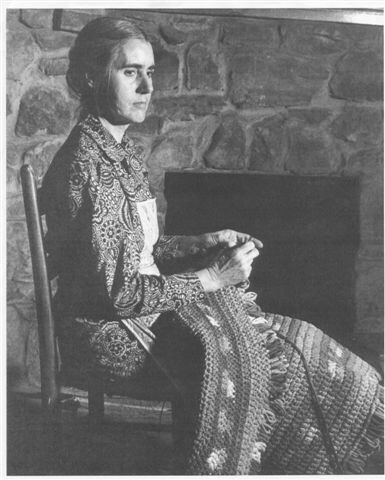 Mrs. Ollie (Smith) Robbins of the Alpine Community is in the process of making a rug.